I love lunching in North Melbourne, it’s quick and easy to get to, there is always parking and it’s not as packed as it can be in the likes of Fitzroy or Richmond. To date, I’m yet to have a bad experience there, so this week we ventured in to finally cross Fandango off my list of brunch/lunch spots to visit. Stepping into Fandango is like taking a step back in time, it actually reminds me of going to my Grandparents house. It’s fitted out with mismatched retro furniture and indoor pot plants that give it that welcoming old time feel. Add to that the incredibly friendly staff and you feel right at home. We arrived for a late lunch and fortunately for us the lunch crowd had cleared out, so were seated right away and even had space for the stroller. Having said that, within 15 minutes of arriving it was packed again (would have easily been 2.30pm by that stage), which definitely says something about this place. Once we had made ourselves at home we checked out the menu and were really stuck on what to order because there were so many items on there that we wanted to try. In the end we settled on the French toast (French toast with cinnamon poached apples, crispy bacon and maple syrup) and the Chicken Sandwich. Our food came out really quickly and I was really overwhelmed by the size of our dishes. 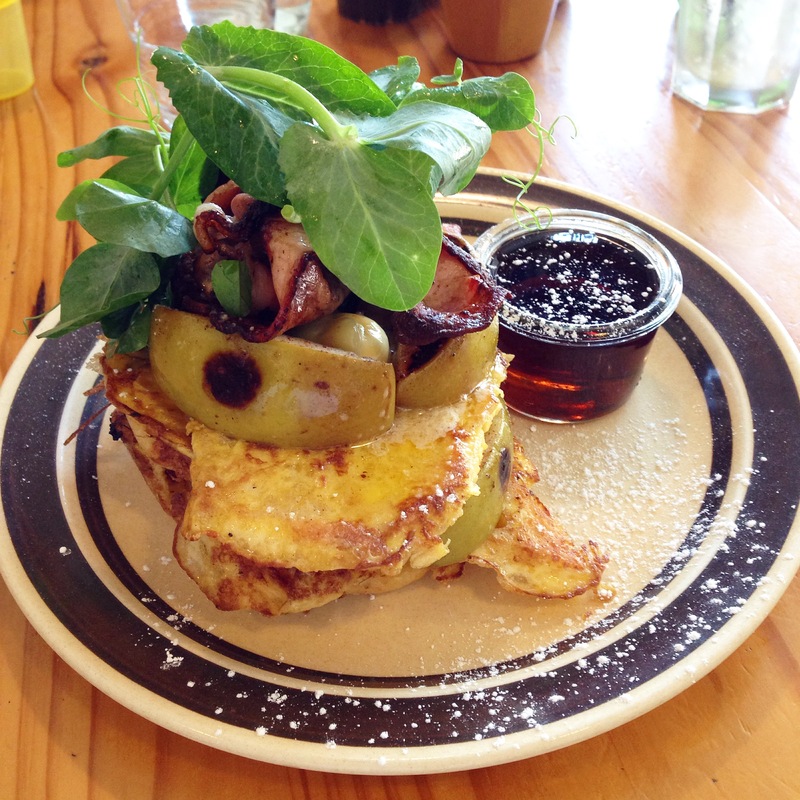 The French toast was huge, but give it was mid-afternoon, I was pretty hungry and up to the challenge. The apples were poached, but still had a bit of crunch to them which unexpectedly worked. The toast itself was eggy as you’d expect, but beyond that it was pretty simple, so the maple syrup came in handy. Having said that, this wasn’t really a sweet French toast, but they provided the maple syrup if you wanted that added sweetness, which of course I did. 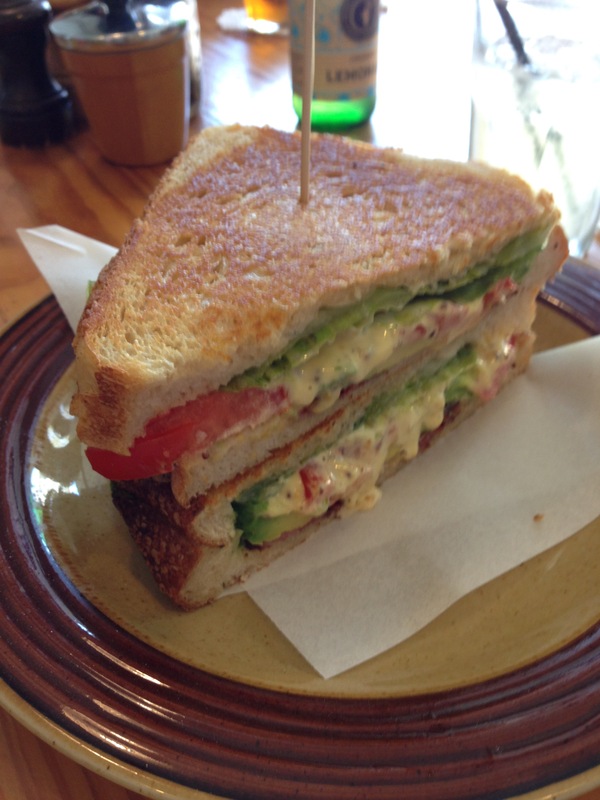 Mum had the chicken sandwich which again was huge. She said it was delicious although they were a bit heavy handed with the mayo. All in all, I liked Fandango, it felt homely and welcoming which not too many places are able to do. 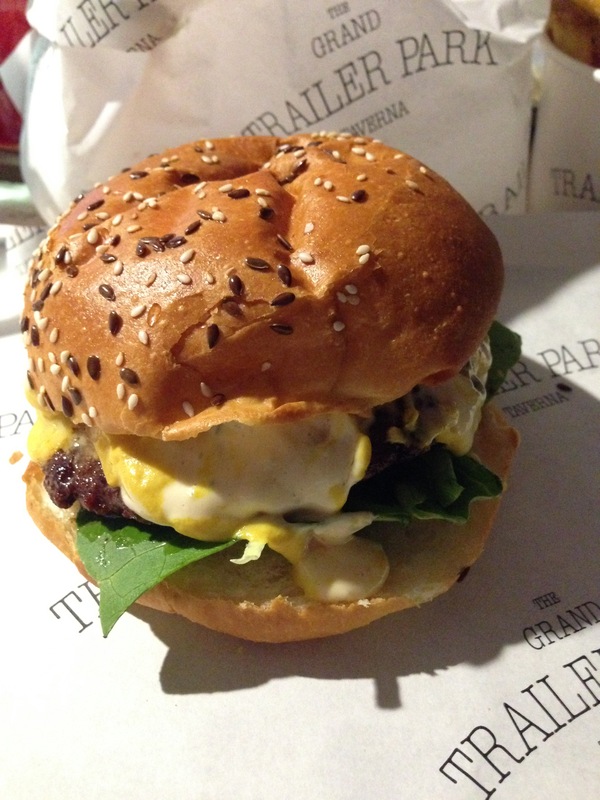 Any time I speak to my foodie friends, the Grand Trailer Park Taverna is guaranteed to come up in discussion. All the talk at the moment is that it has the best burgers in Melbourne, which is a pretty big claim given all of the American style burger joints popping up around town. We ventured into the city (and braved the crowds) for White Night and decided to make this our first stop to load up on calories for the long night ahead. I have to admit, I was worried that we wouldn’t get a table, but to our surprise there was plenty of space, it looked as though people were heading in for a quick bite and then leaving, so the tables were turning over really quickly. The fit out is really cool, it seriously feels like a trailer park. I know, I know, obvious given the name, but it’s not often that it’s executed this well. To that, it also has a really cool bar feel. The tunes were pumping and there wasn’t any table service, so all orders had to be placed at the counter. When I had a look at the menu, the first thing that grabbed my attention was the spiked shakes. Seriously how could it not? 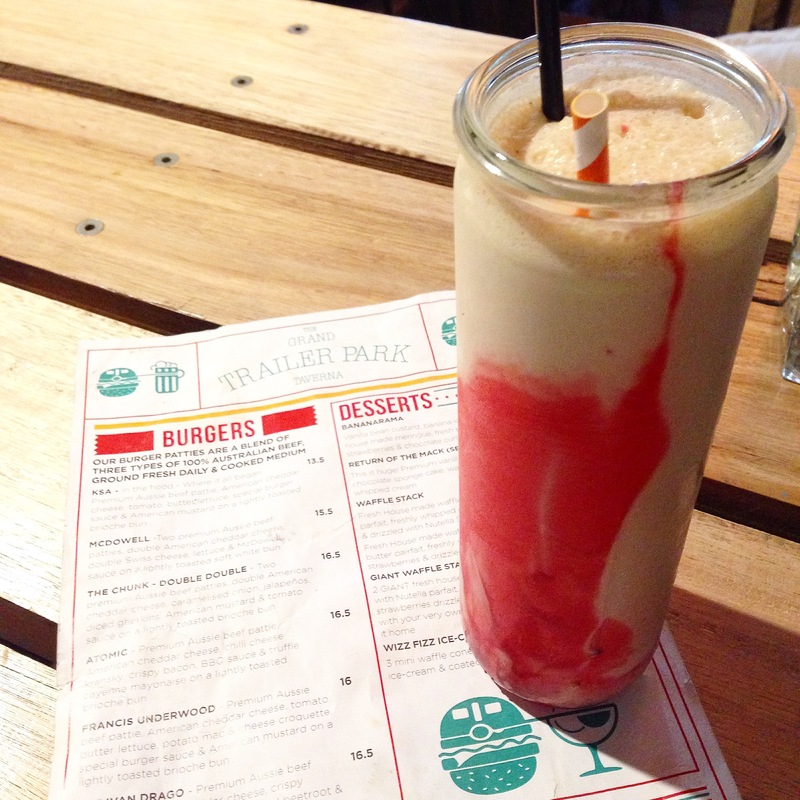 They had a PBJ shake with rum, another with kinder surprise and another with salted caramel – talk about tempting. So before I even looked at the burger menu, I was up at the bar ordering a PBJ shake and let me tell you, it was amazing! I’d go back just to have another one of these. Once I got over my awesome shake, I checked out the burger menu and decided to order the KSA (which is more or less a standard burger without the frills) and the husband picked the McDowell (pretty much a double cheese burger), with a side of hand cut chips. Our burgers came out pretty quickly and all in all the weren’t bad. Mine was tasty, the patty was cooked well and was even a bit crispy on the outside without being burnt. It wasn’t huge, but it was still messy to eat, I lost all of my filings out of the opposite end that I was eating from. The husband was happy with his burger, he said it was tasty but he felt like it needed another element to differentiate it from other cheeseburgers. The chips were also good – they satisfied my crunch test. There’s nothing worse than soggy chips. Were they the best burgers that we’ve ever had? Hmmm, not really, but they were still pretty good. If you’re in the area stop in, if for nothing else to give the spiked shakes a crack – they’re a game changer!